Jeffrey Hou recently gave a talk at the Rachel Carson Center in Munich entitled ‘Urban Gardening as Insurgent Placemaking’. It was live tweeted, but from what I can gather it was neither recorded nor transcribed. So, based on the 10×120 character summary, I think Hou argued that community gardening in cities creates new public spaces and social groups. In some parts of the world these ventures are so successful in creating actual community, they are starting to be recognised institutionally in a variety of ways. 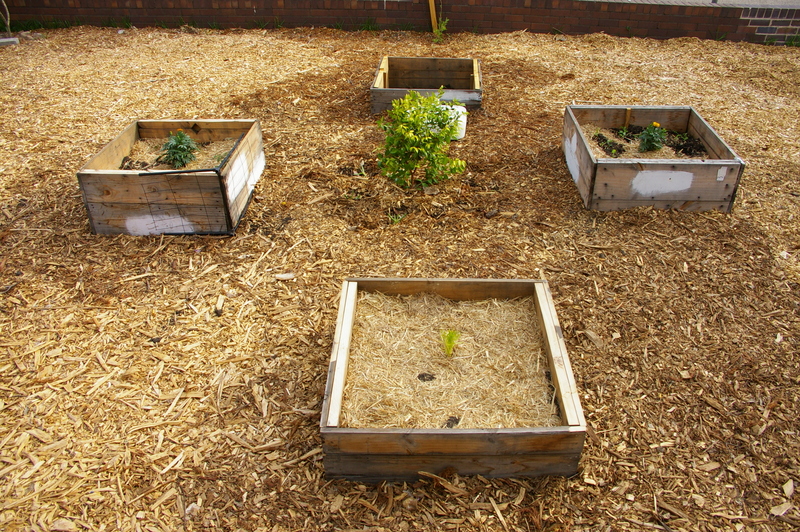 Government organisations are incorporating these grass roots gardens into their social planning schemes. I want to read more of Hou’s work because I think the title implies a far more complex and political idea than the live tweets would suggest! * But at this stage, I’ve taken up on the idea impressed upon me by the title and ran with it! 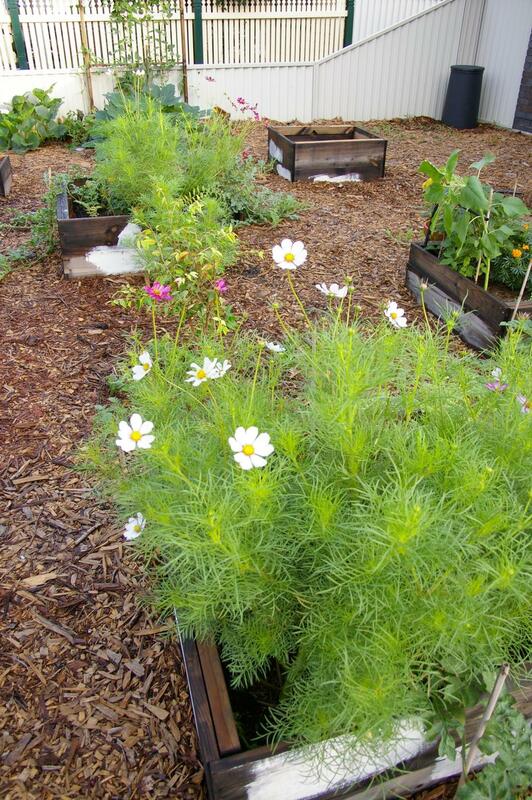 For me, the name implies that urban gardening is an insurgency against particular kinds of ‘placemaking’. Placemaking is a corporate buzzword for the intentional planning or structuring of community. It is a well intended buzzword, in the sense that it implies a need for livable cities, community and public space. But the word has been co-opted by those with financial stakes in ‘urban renewal projects’ (read: the bulldozing of former inner city industrial sites to make way for high-density luxury residential developments for the new managerial class). 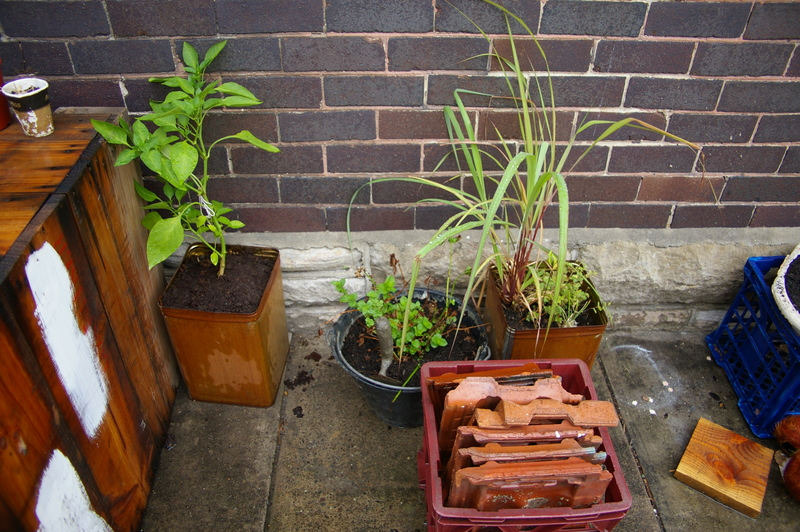 In theory, urban gardening projects counteract the kind of development that reduces the size of public space for private interests, which is to say the kind of development that requires strategic corporatised ‘placemaking’ to produce the feel of community and give the impression of public space, in order to make the place itself seem commercially appealing for investors. If urban gardening is insurgent placemaking, it must create community and public space that rebels against such corporate interests. We think our share house has an insurgent force within it. Although as I sit here writing this on a Sunday night in the warm buzz of the home, with flatmates preparing dinner, a glass of wine by my keyboard, a cardigan and a gingham table cloth, I don’t feel like a rebel. Nevertheless, this house is not just a place to temporarily rest while we rampantly consume all that the city will allow. It is not a stepping stone on the way to investing in a inner city apartment. This house is not a luxury commodity, where once-were-radical thirty somethings give up on their ideals, get ‘real’ jobs and let IKEA do all their domestic thinking for them. The house, or more specifically the garden, asks us to turn away from rampant consumption and engage in work: composting, weeding, tilling, planting, watering, harvesting and tilling again. Such activities interrupt the flow of capital within a beautiful and seductive city that tries to lure wallets out of their homes at every opportunity. Earlwood Farm demands we slow down and, in creating a new domestic ecology, we cause trouble in the larger economy. 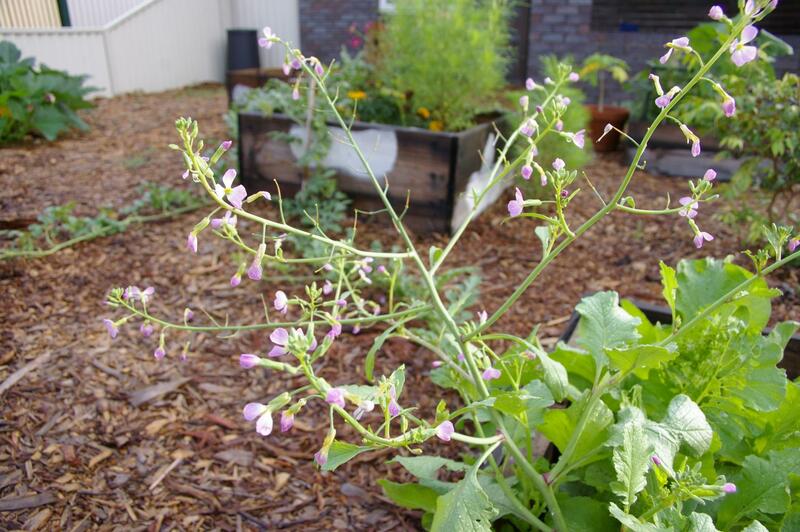 We don’t have to buy leafy greens for weeks on end, or radishes, watermelons or beans. So the more the garden grows, the less we have to shop. We get dirt under our nails instead of getting a manicure; we get muscles from labour rather than a gym membership. We are not claiming to be outside the economy: we don’t want to set The 1/4 Acre Independent Republic of Earlwood; this blog post is being written on a mac computer; and we were most excited to get online and purchase seeds and plants for the winter garden. But the farm refuses to be caught in the rapids of late capitalism and, as such, those tending the garden disrupt the system too. Last week we invited a bunch of people around to help warm this farm. And people came and brought food and some stayed and danced in the shed until late in the evening. The farm has been officially blessed by all our friends. And hopefully this signals the beginning of our little domestic insurgency. * I actually only learned about Hou’s though the RCC’s twitter feed! He has actually written heaps on these ideas and I will follow up on this after some proper reading of his work on these concepts. 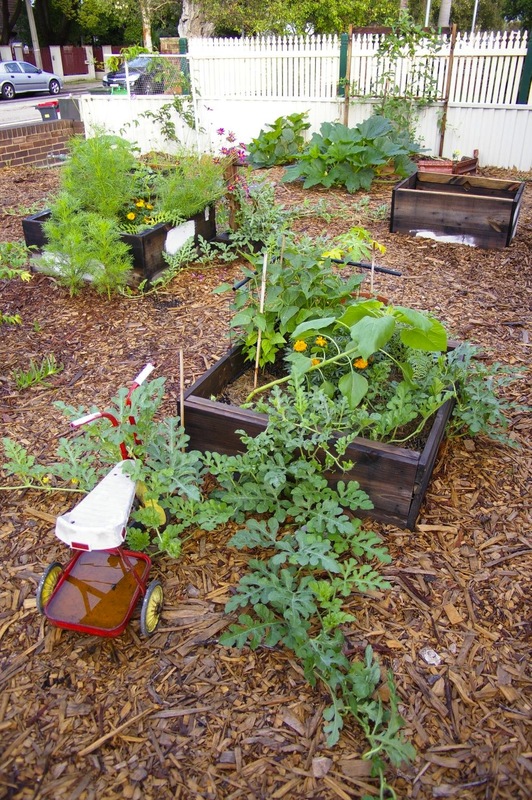 This entry was posted in News and tagged community garden, insurgency, jeffrey hou, placemaking, rachel carson center, urban farm, urban gardening, urban renewal on May 26, 2013 by earlwoodfarm. We were honoured to have Professor Deborah Bird Rose come to the farm yesterday to perform a cleansing ceremony, in preparation for a ritual blessing we will have at our Farm Warming party in a couple of weeks time. 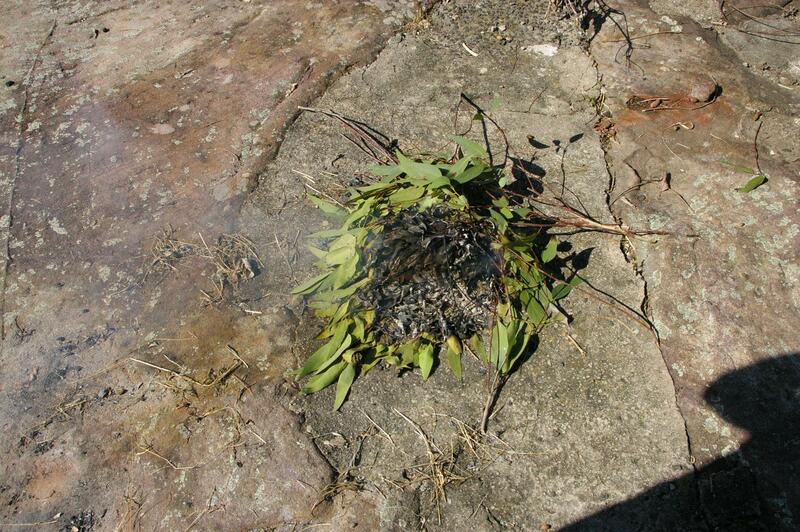 We asked whether or not “smudging” is an indigenous American tradition. 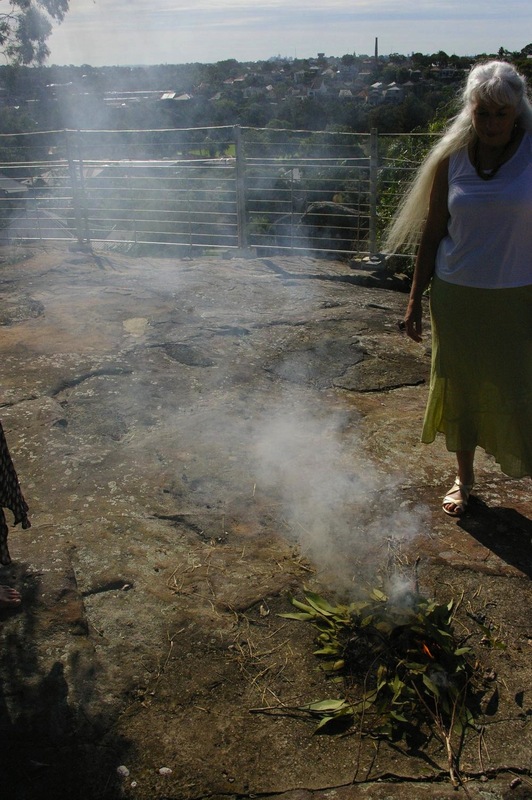 Debbie said that fire was an integral part of most indigenous cultures. Sage is native to North America, so perhaps smudging with sage links to an Indigenous American tradition, but that you can use local leaves to reference the land you are in. 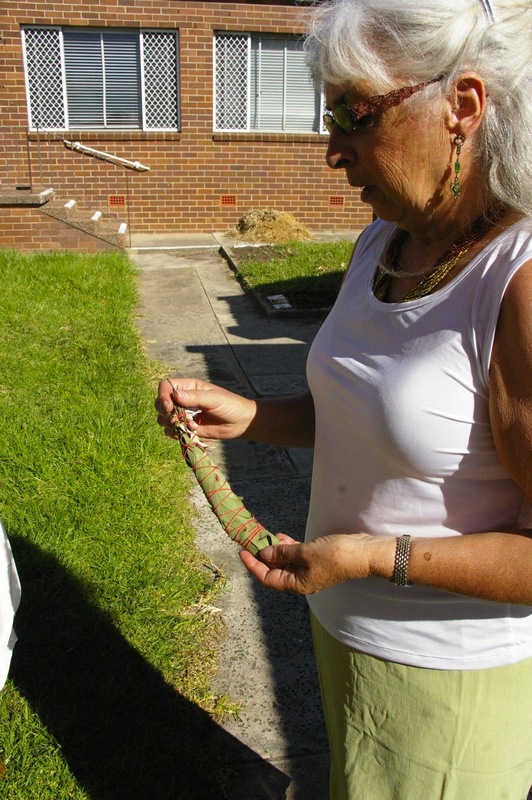 Debbie made a smudge stick of iron bark, tree fern, tea tree, with a little bit of sage especially for Craig. When not volunteering her time to help us make this house a home, Deborah is an inspiring environmental humanities scholar. She has a particular interest in animals and the tragedy of extinction. Her article on human relations with Flying Foxes is an engaging reflection on our need for these incredible creatures. She also co-edits the new journal Environmental Humanities. This entry was posted in News and tagged blessing, cleansing, deborah bird rose, fire, ritual, tradition on May 5, 2013 by earlwoodfarm. If we didn’t already have enough sepos* at the farm, with representations from both sides of the Mason-Dixon line living in the farm house, today we welcomed Rory from Burlington, Vermont. 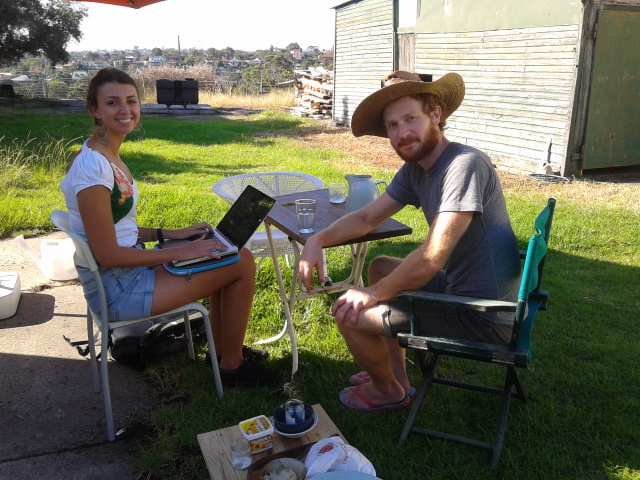 Rory is a study-abroad student engaged in an excellent project: researching urban food production in Sydney. She met Craig last week at Alexandria Community Garden and today she came up to the farm to interview us for her project. It was exciting to get an opportunity to reflect on why we are getting into organic food growing and also to eat lunch with a guest who was interested in listening to us speak about these things. We look forward to seeing how her research develops. * ‘Sepo’ is abbreviated rhyming slang for an American, coming from yank which rhymes with “Septic Tank”. 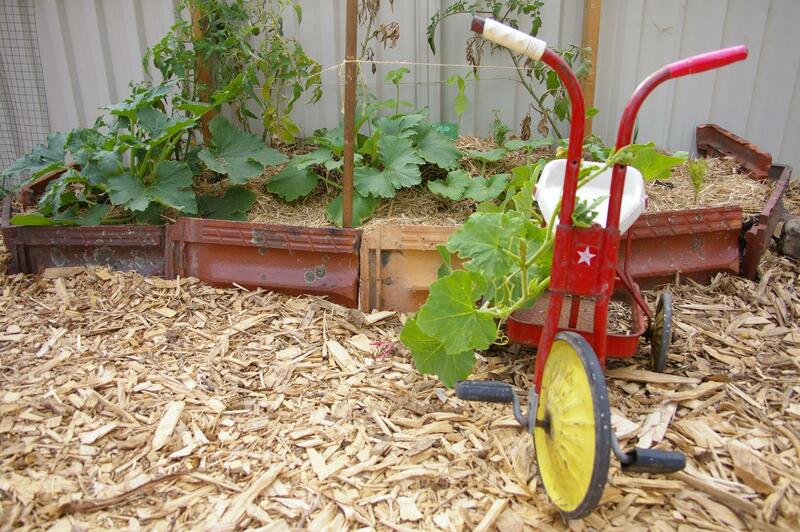 This entry was posted in News and tagged sydney, urban farm on April 15, 2013 by earlwoodfarm. After the record breaking heat of January, and with no mitigation strategy in place to protect the plants, the farm was looking a bit sad. We didn’t blog about it. We told stories of our triumphant lack of planning and subsequent abundance of variety. This wasn’t a lie, but it did mask the fact that we weren’t actually producing any food. To call Earlwood Farm a “farm” seemed like a massive overstatement. Our first okra plants (the beautiful little seedlings that feature on the header of this blog, no less) all died suddenly after the hot days. The tomatoes were shriveled up and not producing any fruit. Our pumpkin and zucchini plants were so ravaged with powdery mildew it looked as though we were going to have pull out the only plants that were producing food. Fortunately, after violent pruning of the sick plants with Craig’s new soil knife (gifted to CMJ by The Varner household of Atlanta, Georgia), extra manure and nightly spraying with milky water to try and crush the spores on the plants brought the diseased plants back from the dead. The cooler days have given all the other plants a chance to either bounce back or commence a rapid growth phase, which is very exciting because we feel like the farm is starting to take off. A modest yield: snake beans, radishes and black beans! Autumn’s brilliant sunny weeks, interspersed with some decent rainfall, have turned things around for Earlwood Farm. We now have had some produce to harvest: snake beans, black beans, chickpeas, radish and late season watermelon. The passionfruit vine has taken root after a slow start and a violent bout of sunburn in late summer, and the cosmos have taken hold encouraging lots of bees to come and join forces with the farmers to help the growth. We have now moved on to phase two of the garden. We’ve composted the “heavy feeders” such as the tomato, zucchini and pumpkin, after a small yield, and planted some root veges and leafy greens that require less nitrogen and that will grow well in the cooler months: tatsoi, beetroot and lettuce, so far, with more planned once we get started on phase 2 of the farm in the back half of the house. 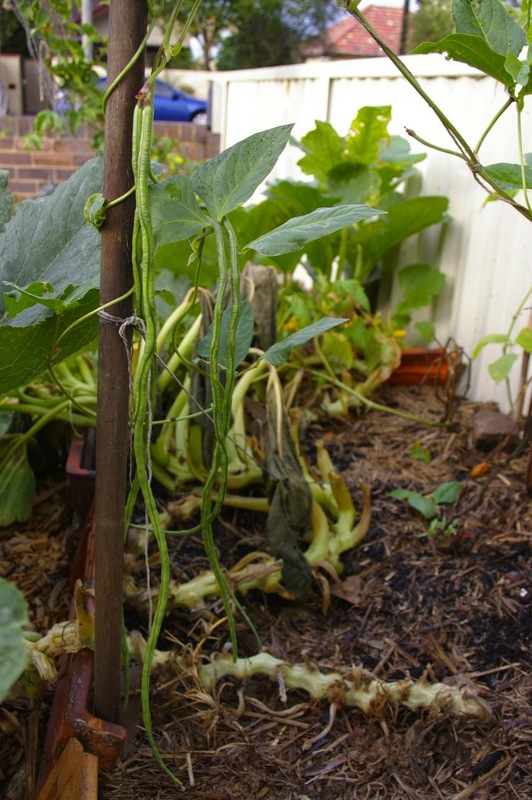 This entry was posted in News and tagged autumn, black beans, chickpeas, cosmos, passionfruit, powdery mildew, radish, snake beans, soil knife, watermelon on April 14, 2013 by earlwoodfarm. The weekend began with a trip to Newnes in the Wolgan valley. We shared a campground with kangaroos, wallabies, wombats, goannas, ducks, magpies, crows and one very bold satin bower bird. We bathed by skinny dipping in the Wolgan river and hiked to a disused rail tunnel that is now full of glow worms. All this was on the way to our two-day ‘Starting an Organic Market Garden’ course at Milkwood Permaculture Farm. Milkwood is working farm on a magical property in the hills somewhere south east of Mudgee. We arrived on a stormy Friday evening ready to meet people, build a community and learn amazing things. At Milkwood we camped near a garden full of produce, wild blackberry brambles, huge gum trees and transportable structures housing chickens and geese. We cleaned up in a rocket powered shower and spent the days in an incredible short course that helped us get serious about the future of Earlwood Farm. Michael telling us how to do it! Pyrex Pan Earthbag Dome windows. Ideal windows for the home of Rose the chef! It is difficult to summarise our experience quickly because in two days we went through every aspect of building a small market garden, from permaculture 101 and seed cultivation to harvesting and selling produce at a farmer’s market. We also learned about impact of ancient geological history on contemporary soil quality in the spectrum from high fertility (basaltic) to low fertility (rhyolitic) soil. We learned some handy maxims such as the three pillars of permaculture (“earth care, people care and fair share”), a neat one that helps you rethink how you approach fertilising your garden (“feed the soil, not the plants”) and another that encourages you think more holistically about your garden (“the garden is an organism”). We learned that organic market gardening requires more labour from management (smiley face) and that organic permaculture gardening is a life practice (much like the work of an artisan, the farmer should constantly be refining her craft and asking herself if she can do it differently and/or better). We learned that everything from the position of the sun, the direction of the prevailing wind, the average rainfall and temperature to the quality of the seed and soil and the amount of attention you pay to the nuances of each plant’s behaviour affects the quality of your produce. We ate tasty food that was the fruit of such mindful labour, mostly (if not all) grown in the Milkwood market garden and all prepared onsite by Rose. We camped out in a storm on the first night, charged by the electricity in the air we were ready for two days of study which was an incredible communal experience and we left completely invigorated and ready to return to Earlwood and begin seriously planning our own farm. The main takeaway for us, beyond all the amazing tips and tricks for getting your garden to grow, was that we needed to become clearer about our goals and what we actually want to achieve on the Farm and then plan our work with these goals in mind. As the last post demonstrated we have proceeded in pretty much the opposite manner so far. Our “farming” has been entirely ad hoc, with much excitement and only minor success. These activities have been great for making space in our lives for the labour involved in starting an urban farm in the front and backyards of our rented house, but much more planning and labour is needed if we want to really begin to provide food for ourselves and some for market. The other takeaway was that community is essential. This farming business requires community and the help of others. On this front we think we are doing alright, with community as the foundational idea of the farm – sharing living and inviting our friends to working bees. This has had a flow on effect and we keep getting given worm farms and planter boxes and plants from friends all over Sydney. On the way home from Milkwood we stopped into Kandos for the final day of Cementa_13 and saw Pia van Gelder perform at the golf club, camped by a lake surrounded by more blackberry brambles, we were awoken at sunrise by the dulcet tones of Liam Benson singing Video Games by Lana del Ray on an island in the middle of the lake (which I’d never heard before but it haunted by dream so significantly I [Jen] had it stuck in my head for the next week! ), we bathed in the lake and wandered the streets of Kandos looking at works by many artists including Jacqueline Drinkall and Connie Anthes. We were also utterly duped into thinking Kandos was an ecotopia by Ian Millis’s fake tourism poster spruiking the former-cement town, not as the slightly creepy time capsule that it feels like, but rather as a world leader in sustainable technology and eduction. We were almost sad to return to home. But our malaise was thwarted by the promise of yurts. The following week we engaged in a 3 day creative development lab for the Yurt Empire at 107 Projects. The lab was as invigorating as the course at Milkwood and also is supported by Milkwood! So stay tuned for more on the Yurt Empire project and more on the developments of Earlwood Farm and, excitingly, for news of our return trip to Milkwood over Easter with the other members of the Yurt Empire for the second development and Yurt building intensive! This entry was posted in Other Farms and tagged brambles, camping, cementa, chickens, ducks, earlwood, food, garden, geese, glow worms, goannas, kandos, kangaroos, learning, milkwood, mudgee, newnes, permaculture, planning, wallabies, wolgan valley, wombats on March 2, 2013 by earlwoodfarm. We take baby steps here at Earlwood Farm. While many farmers would have irrigation at the top of their list of priorities and, due to the necessity of water for life, said farmers would likely have purchased and installed the irrigation system before doing any planting, here at Earlwood Farm, we have approached the issue of water slightly differently. We have aspirations to build both grey water and rain water harvesting systems, but with the exception of a small pink bucket for dish water, we haven’t really done either yet. So, until a couple of days ago, we had been watering all our plants for several months (from the mint and the rosemary to the passionfruit and pumpkin) with a tiny three litre watering can. This would have been fine if there’d been a steady stream of rainy days and we just needed the can for the odd dry spell, but alas, with the exception of a downpour on Christmas Day, Sydney has had a remarkably dry Summer. 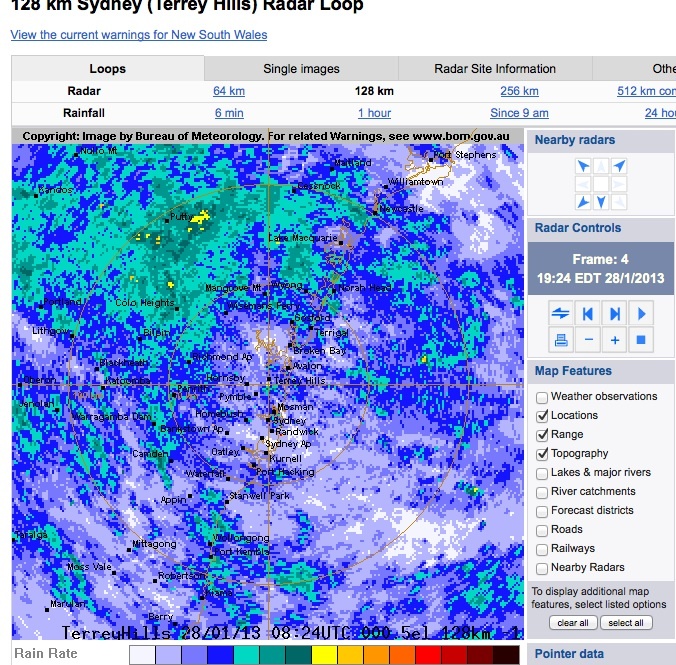 However, since we’ve purchased a hose two days, there has been two solid days of rain, with more on the way. So we haven’t really needed a hose this week, but it is quite good to finally have one. Beside the the Great Hose Purchase of 2013 there was more sprouting of interesting things on the Farm. Craig is utterly enamoured by Jackie French’s Backyard Self Sufficiency and, aside from falling in love with the down-to-earth enthusiasm of her writing, he is really excited about the possibility of growing anything and everything, as she recommends in her book. So, we’ve sprouted some really old dried chickpeas and black beans that have been sitting in my pantry for several years. We are surprised by the memory that remains in the seeds, the fact that even after sitting dried in a little jar in the dark they still know how to grow into a little plant. We sprouted them much like you would lentils, by soaking in water and leaving to dry and then, once they have sprouted planting them in little coir seedling pods. 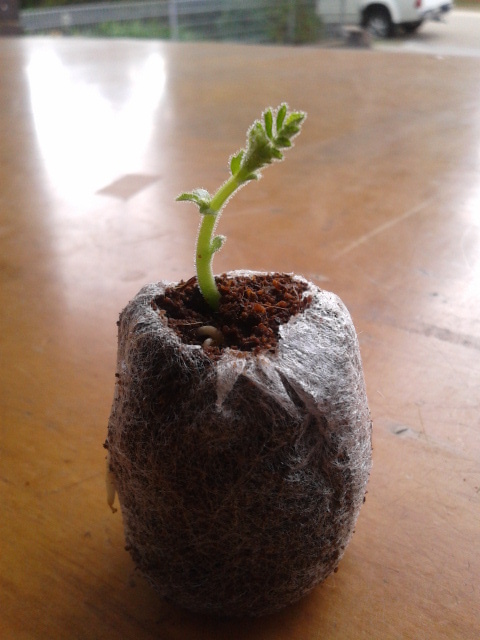 They are such sweet and energetic little sprouts. We also have planted some lychee seeds. This activity has accidentally borne a multi-decade fruit-growing project. After some research, we discovered that the trees initially sprout quite quickly to become a short shrub of fifty centimetres, but then they just chill out and sit dormant for three to five years before beginning slowing growing again. 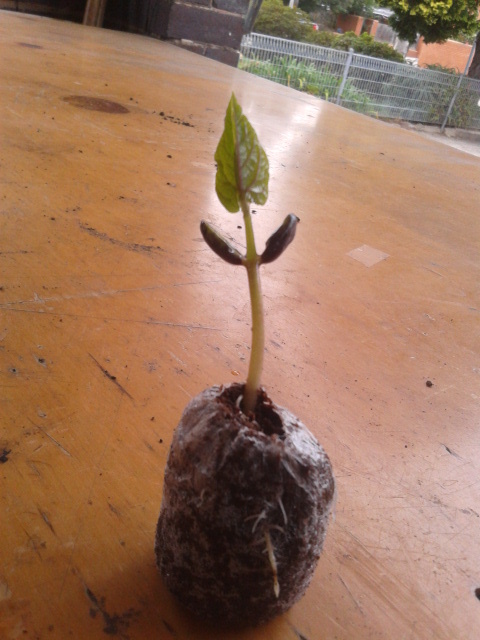 As such, if they make it through this long infancy and we take care of them, we can expect our lychee trees to fruit sometime in the next ten to twenty years. We also have accidentally seeded 16 watermelon plants. Notorious for their long vines and large fruit, we are not quite sure to do with these 16 baby monster plants. The reason we have ended up with 16 is because Craig handed the reigns of planting to the young girl in the house behind us instructed her to seed 16 cucumber plants. He handed her the wrong envelope and so it turned out to be 16 watermelon plants. 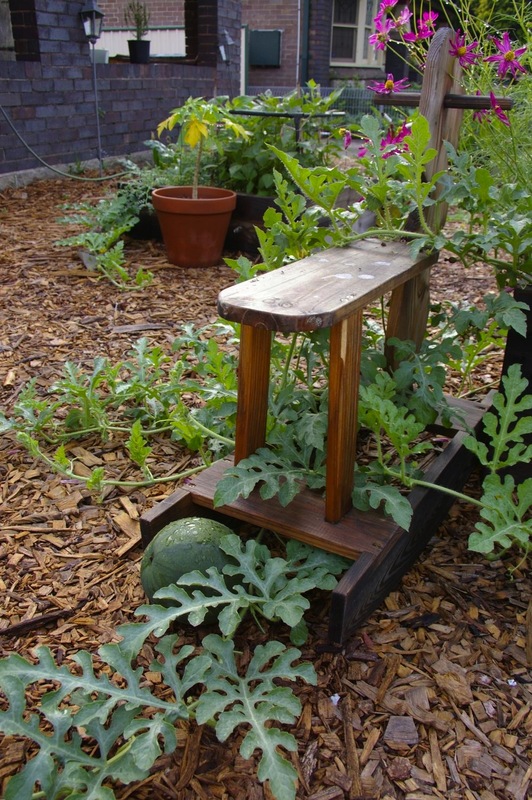 We are thinking of trying to dump some of this unwanted litter at the local watermelon shelter in the middle of the night, and hope that they will find a home in the yard of some do-gooder green thumb before they have to be put down. We have had some good growth beginning to happen in the garden too. 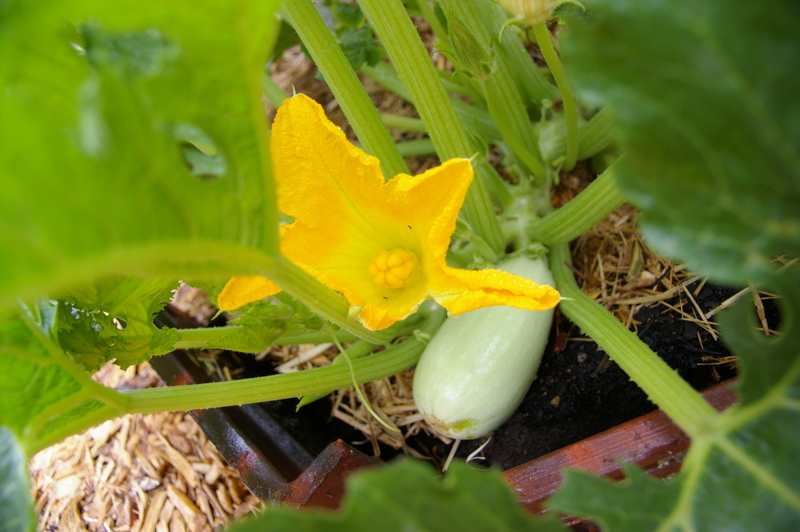 The other morning we found a bee in the zucchini and pumpkin flowers, and now they are fertilized and starting to fruit. 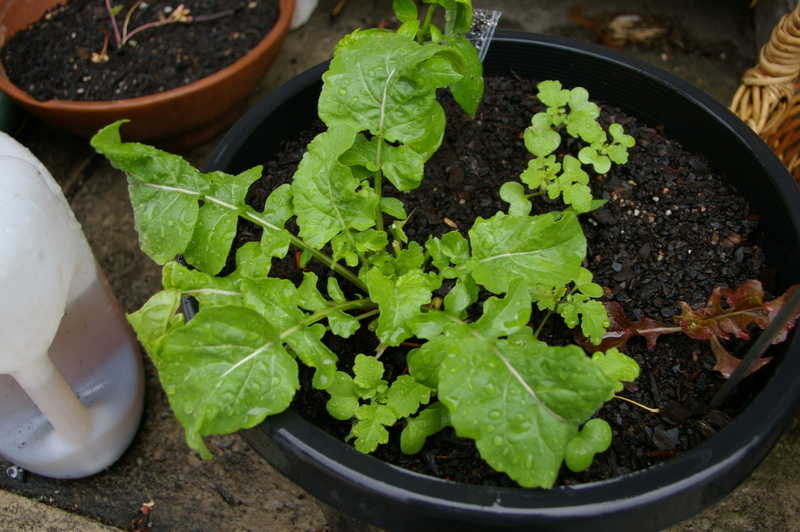 We also scattered some seeds quite haphazardly in a pot and they are developing into a nice little cluster of plants (basil, mustard greens and rocket). We also received a lovely gift from Aaron’s friend Johnny who was leaving Australia to return to the USA: a capsicum or “bell pepper” plant, some mint, lemongrass, oregano and also a worm farm. Although we are almost overwhelmed by variety, we still have plenty of space for more plants and more planting. Much like the last post, the farm is still running on blind enthusiasm, accident and luck. As I write this post it is still raining. 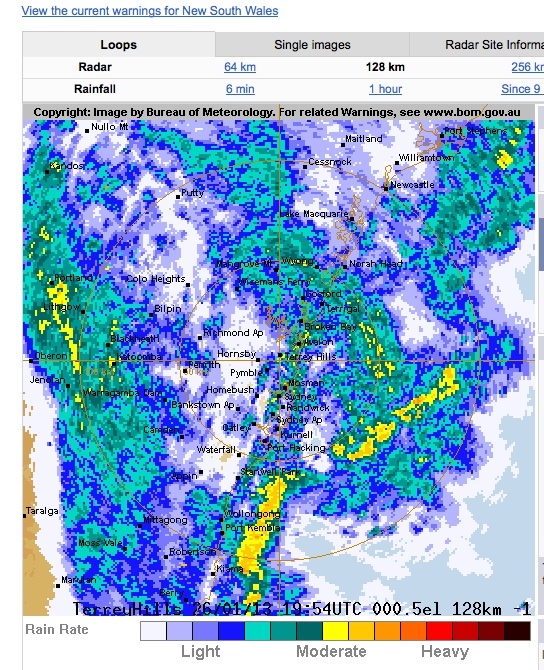 High winds are expected to hit Sydney in about half an hour. We are hoping that the seedlings that we’ve planted out the front will make it through this wild night, if they do we will no doubt have exciting news in a few months about the abundance of chick peas and black beans and watermelons alive in our front garden. 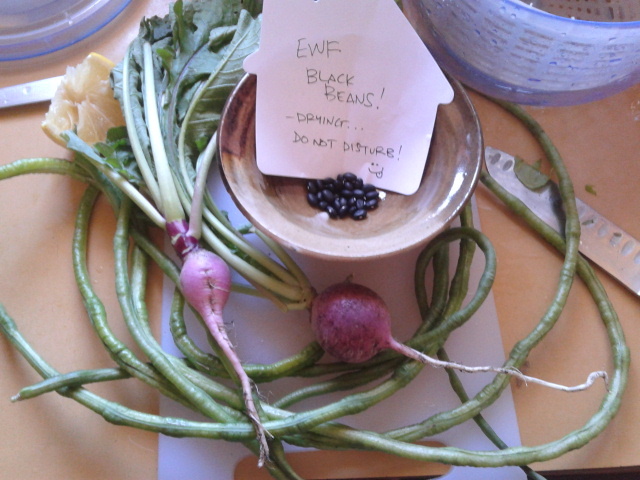 This entry was posted in News and tagged black beans, bureau of meteorology, chick peas, irrigation, jackie french, rain on February 10, 2013 by earlwoodfarm. Since the inaugural busy bee things have been a little bit quiet on the farm, largely because the holiday season took over. We hosted Christmas and New Year at the farm and so we had to focus on doing the ‘little things’ like making a Christmas version of the Earlwood Farm logo, decorating Craig’s Wollemi Pine, painting wrapping paper or making chutney. The celebrations were lovely, but we have had precious little time to focus on the farm itself. However, we have had mini busy bees between parties. Instead of planning, we are operating on blindly opportunistic enthusiasm. So, even with no planning and little time, we have made some headway. 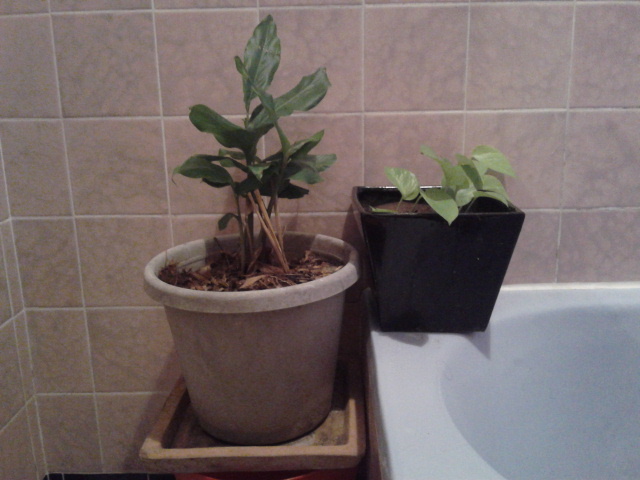 For example, we purchased a Cardamom plant and put it in the bathroom. We’ve also started propagating a range of plants from cuttings: Mulberry, Grevillia, Rosemary, Frangipani, Pig Face and we’re on our 2nd attempt to get a Curry Tree going. The Rosemary and Mulberry are from Alexandria Community Garden, the Grevillia and Pig Face are from local verge gardens and the Frangipani we found dumped on the side of Illawarra road. We got the latest Curry Tree cutting from Alfalfa House. Then, one Sunday morning at Addison Road Community Markets, we stumbled upon four giant apple boxes, 20 roof tiles and some old chicken wire for sale at Reverse Garbage. $80 later we were the proud owners of said items and they were delivered to our front door. Two of the apple boxes have since been ‘cleft in twain’ with a circular saw, making four decent sized planter boxes for the front yard. In the planter boxes we have a range of delights from the edible (Coriander and Tomato) to the flowering (Cosmos and Marigold). Craig and I also paid a visit to Randwick Community Nursery, which is a council run operation, trading mainly in native plants. We picked up a Bracteantha Bracteata (!) or a Paper Daisy, a Rosemary and a Hibbertia Scandens (!!) or Guinea flower. On another occasion Sophie had loaned us her car and we took the opportunity to visit a run-o-the-mill commercial suburban nursery in Kingsgrove. There we purchased a Lilly Pilly tree and a Passionfruit vine for the front yard, and a Gardenia for near the front door. My lovely mum also gave us a Lavender bush, a hanging pot of Chilli and decorative Curry plant as gifts for Christmas. 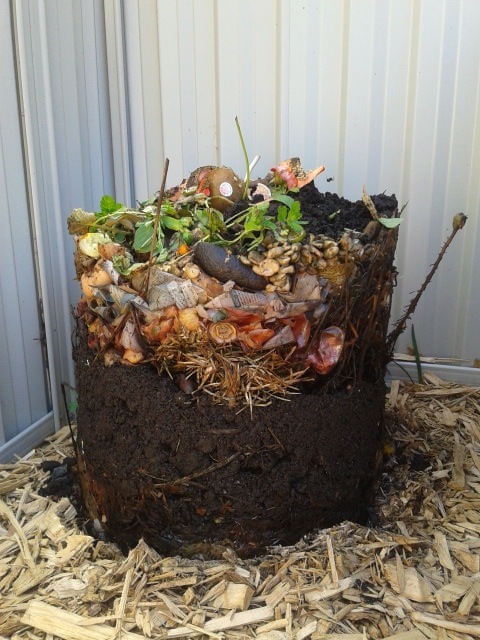 Also, we are eating heaps of Fruit and Veges and composting like crazy. Sophie came with a compost bin and the results of our combined efforts belong in a text book. But, as you can see, at the moment it is a complete fruit salad of a backyard garden-farm. At least there is nothing monocultural about the place! We are overwhelmed by variety and slowly learning the needs of each little wantonly individual plant. For example, the pumpkins (donated by Dr Kearnes) are bolting, at the expense, it seems, of the first crop of tomatoes and beans. 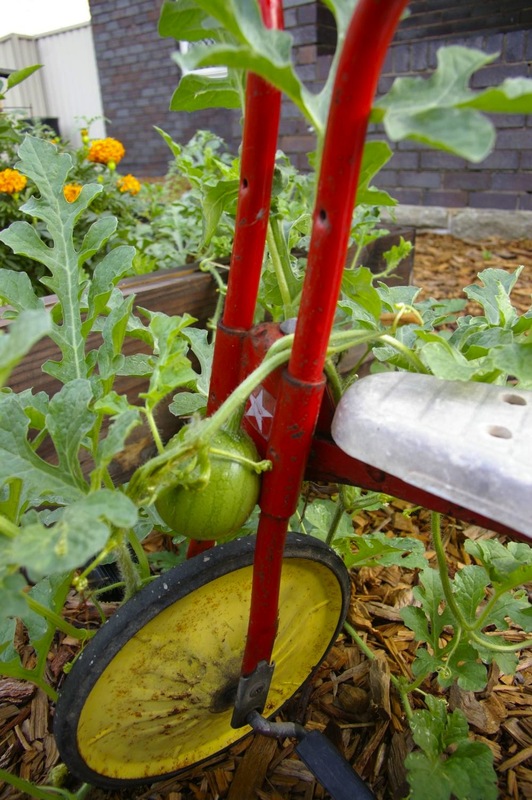 And, we’ve discovered that if we drape the pumpkin’s main runner over Aaron’s cute little tricycle, the sadness we feel about the dying tomatoes is somewhat alleviated. 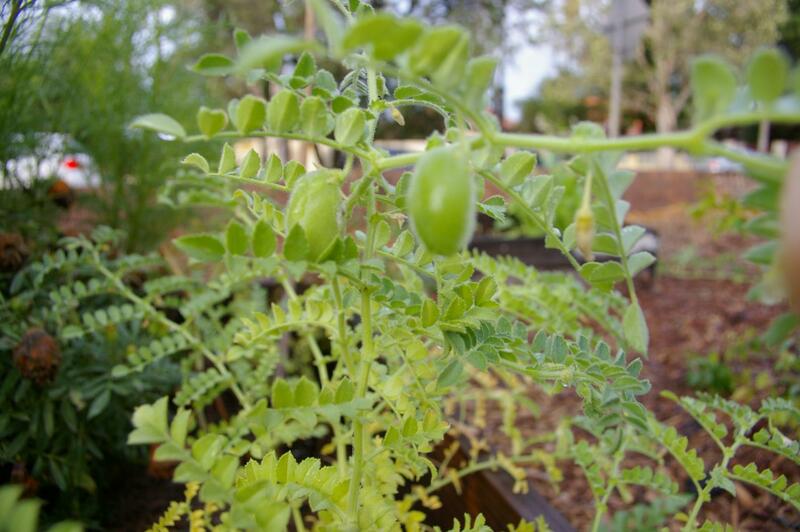 This entry was posted in News and tagged alfalfa house, cardamom, earlwood, milkwood permaculture, sydney, urban farm, wollemi pine on January 12, 2013 by earlwoodfarm.